सावन's Girls Pg (Hostel), a PG accommodation for girls and working women, is located in Jaipur’s Pratap Nagar area. This area is peaceful, good, safe and free from city pollution. The area is adjoining to Sitapura Industrial Area, Colleges, Educational Institutions, Banks and Hospitals etc. The SGP’s Mess facility is an integral part of the home which provides fresh ,healthy, yummy, wholesome and hygienic homely vegetarian food. The SGP uses branded food items only for the mess especially Patanjali, Reliance etc ! There is no compromise with mess facility. Drinking Water provided is purified by RO. Breakfast contains tea, milk with varieties of snacks. 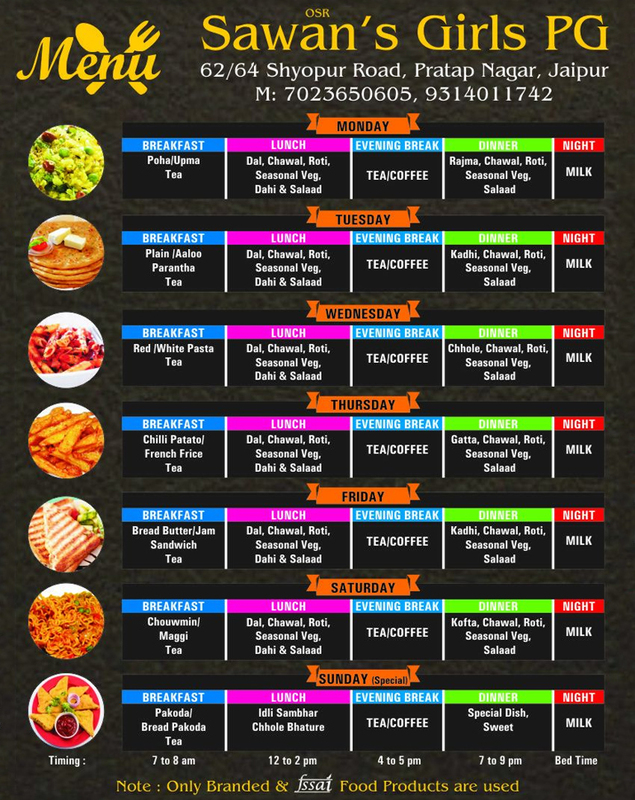 Special diets are provided to the residents on each Sunday and on special occasions. The SGP contains well furnished and ventilated rooms which are available on double sharing basis only. The rooms are with attached washrooms, Geysers during winters and coolers during summers are available. The SGP provides on demand laundry service to the residents ,This service will be chargeable directly by the washerman. The SGP is enabled with high speed Wi-Fi connectivity and provides easy access to the Internet. Only inmates of the SGP are allowed to surf. The SGP is extremely aware of the security of the user. No outsiders are allowed to enter the premises. Public Transportation is available on Tonk Road five minutes walking distance from the SGP. सावन's Girls pg hostel, a PG accommodation for girls and working women, is located in Jaipur’s Pratap Nagar area. This area is peaceful, good, safe and free from city pollution. The area is adjoining to Sitapura Industrial Area, Colleges, Educational Institutions, Banks and Hospitals etc. Copyright 2017 Powered by सावन's Girls Pg (Hostel) .All Rights Reserved Designed By - True Value Infosoft (P) Ltd.